Creating a boundary matrix, originally uploaded by dgray_xplane. (b) determine what kind of form the answer to the question from discipline X might take, if answered by someone from discipline Y. This could be a document or artifact that is ready and available, or it might involve terms that are specific to discipline Y. For example, a designer who wanted to understand user behavior might need to ask for search terms and click-through rates. (c) repeat the above from the perspective of discipline Y. 2. From examining these exchanges you should be able to create two lists, one for discipline X and one for discipline Y. Each list element contains a brief description of the discipline-specific term and why it should be important to the other discipline. For example user behavior > search terms, click-through rates. In the sketch above, these descriptions are labeled A, B, C, D for discipline X and 1, 2, 3, 4 for discipline Y. 3. Now look at your matrix and see if you can find how each cell relates to an area of strategic interest for your company or team. These interior cells represent the points where the disciplines intersect with larger areas of shared interest. If you can’t find the strategic connection that might indicate that the activity might have outlived its usefulness or could be of dubious value to the organization. 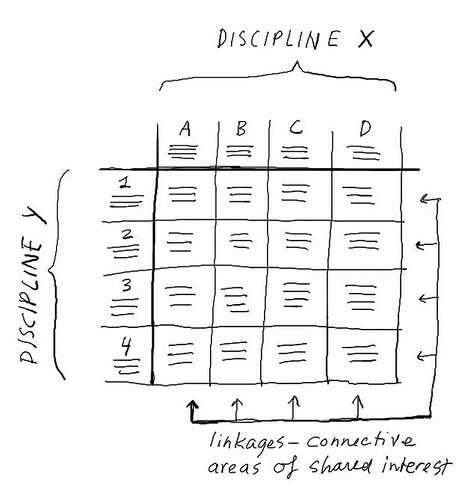 The completed chart is your boundary matrix — a “cheat sheet” for managers as well as people from disciplines X and Y, that will allow them to communicate more effectively and quickly navigate to areas of strategic priority or shared interest. This is a new idea and has yet to be tested but I think it holds real promise. I suspect that the initial value to cross-disciplinary teams will be the conversations it forces about what each discipline does and why it is important to the other discipline, or the organization as a whole. The conversations themselves are an education and culture-building process that will lead to better collaboration, and the better those conversations, the better the boundary matrix that will result. An interesting article – I’ll definitely have to read the paper. After participating in Global Entrepreneurs Week last week and having to explain what I do to a lot of people who aren’t in my industry I’m starting to understand a bit about how to describe what I do from their perspective – although I still have a way to go. I’ll have to give this boundary matrix a go! I have some thoughts about how to turn this into a workshop/set of exercises. Basically I see a room divided into two teams, initially by discipline. Each team does a post-up/affinity mapping exercise to determine their most useful tools and deliverables. Once the big topic areas are uncovered, you draw a boundary matrix on a whiteboard. Cross-disciplinary, 2- and 3-person teams choose a cell in the matrix and go offline for discussion about the area of shared interest and why it’s strategically important to both disciplines. They come up with a short phrase to describe the value area. Repeat until the matrix is completely filled in. I love this idea – without totally getting it (though you’re follow-up comment helps). Would love to hear how it goes if you do it with a group/real people. A worked example would be fab. In the meantime, I’ll have a go myself. Hi Simon and thanks for your note! To be honest, I don’t think I will fully understand it myself till I try it as an exercise! I will try it with a group at the first opportunity. Meanwhile if you try it yourself please come back and tell us about your experience! Interesting idea, Dave. I hope to explore an example myself. I see this approach as an example of the “creating a Pidgin and enabling a Creole” category in the paper. The participants are developing their own shared understanding and language. looks complex but it isn’t so. It’d work well in a group creative collaboration. 1. Create an account at http://www.innovationgames.com. 2. Upload the boundary matrix picture. 3. Create some games and invite people to play. Our system enables this kind of visual interaction. Thanks for connecting Luke! It’s exciting to see you bring these game activities into the online environment. Hi Dave. Great article! Would you be willing to share the results of this exercise (data analytics and UX)?